Eating in Canmore is a pleasure, there is a real movement toward fresh, organic non pretentious wholesome food. Lately Canmore has been overtaken by duck mania! The chef at the Iron Goat offered us smoked duck – wow! (says the vegetarian!). The Coffee Mine had a duck and mushroom soup (we didn’t get to taste as we were already too full) and at the Sage Bistro we indulged in Duck salad – duck confit on mustard greens with pair and creamy brie cheese-hmmmmm!!! Yesterday the heavens parted long enough for us to sit on the patio at Sage Bistro – what a fantastic place. Darek says they make the best Cesar’s around and I had an outstanding glass of wine as recommended by our server. Darek had the Bison Goulash which was rich and tasty with homemade mini noodles. 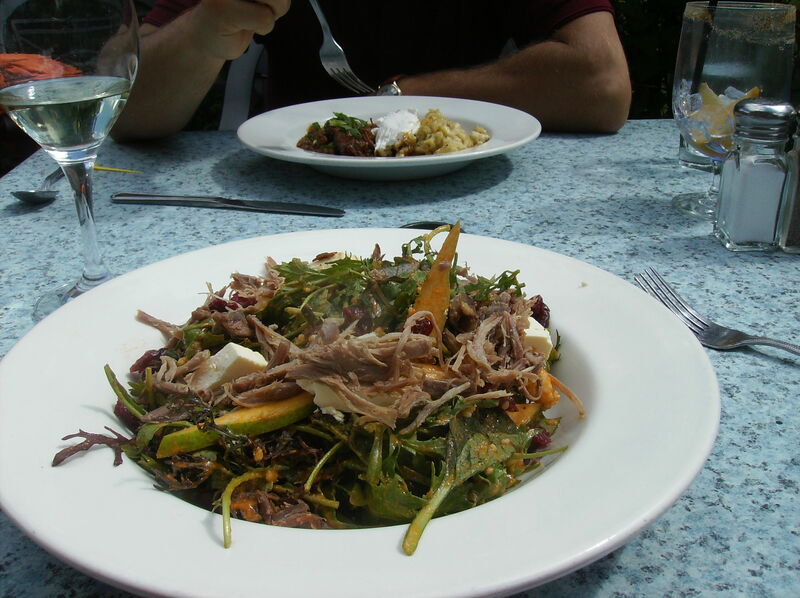 I had the duck salad which really was a rich sensation of fresh flavours and very enjoyable. The Sage Bistro is also going to be opening a wine and tapas bar upstairs which has the locals buzzing! The service was great and we really enjoyed the atmosphere, next time I hope to try the cheese plate appetizer, this time around we wanted to save room for dessert at The Coffee Mine (caramel pecan pie) to die for! The Sage Bistro was well priced and we appreciated that the menu was not too big and had just enough choice. Gluten free is not hard to manage at the Sage Bistro, gluten free vegan may require a bit more maneuvering, that said, the staff was really helpful and I am sure would do their best to accommodate. We look forward to our next visit!